If you've ever been confused about which way forward and aft are on your Norwegian Cruise Line ship, these fish can tell you which way to go. The fish are swimming towards the forward (bow) of the ship. So when you step outside your cabin or turn down the corridor, just check the direction of the fish relative to the location on the ship that you want to go. As ships get larger and more complex, it can be confusing to get from one location to another. 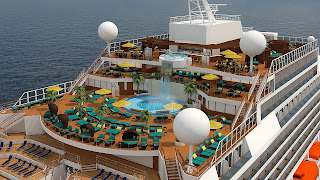 The cruise lines have employed various technologies to make finding your way a breeze. 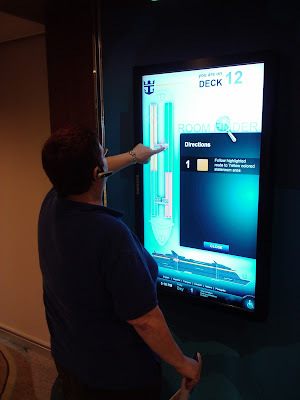 The best improvement is the "way finder" which was introduced on Royal Caribbean Oasis and Allure of the Seas. This touch screen allows you to map your route, find your current location, find out what's currently happening and much more. They are located throughout the ship nearby elevators. This is one of the features included in the Royal Advantage upgrades fleetwide. While navigation is an important capability with the digital signs, equally important is helping you plan your day. 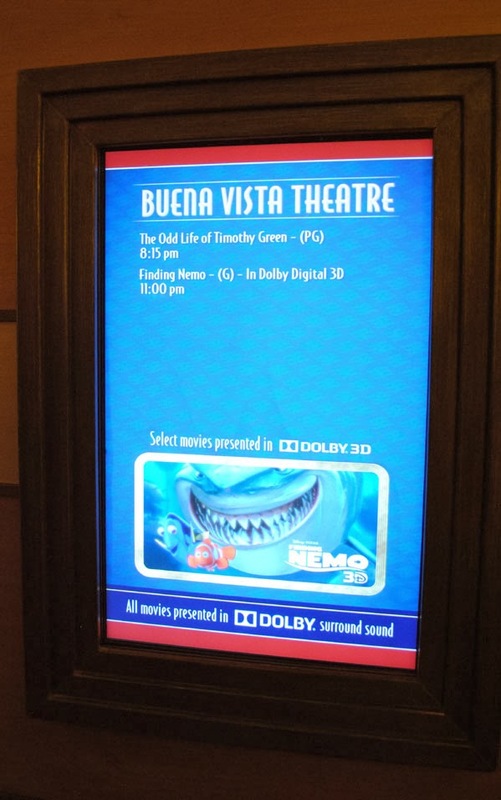 On Disney Dream for example, you can find hours of operation and movie selection for Buena Vista Theatre, you can learn about It's a Small World Nursery and their hours of operation, and find out when and where your favorite Disney characters will be making an appearance. 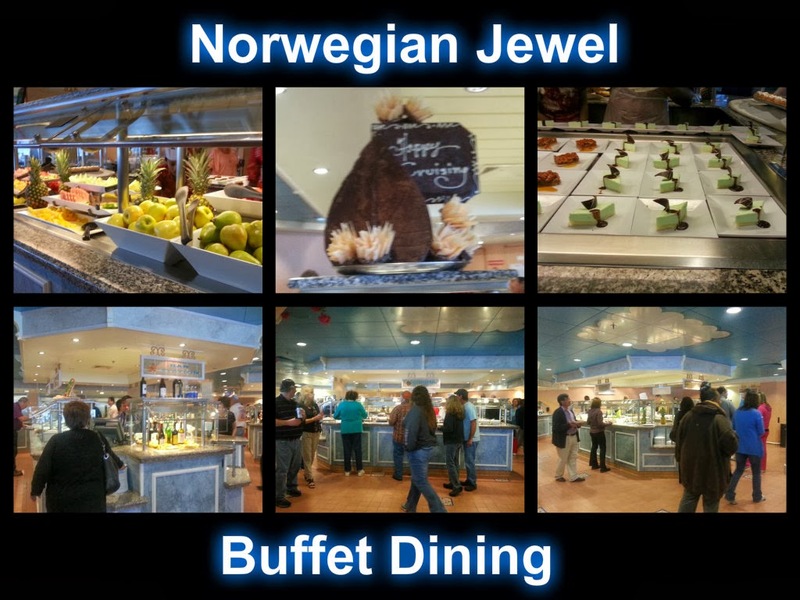 The first to pioneer relaxed dining times was Norwegian Cruise line with their Freestyle Dining program. At first you'd have to call to find out if there was availability, but they were among the first to implement digital touch screens to assist you in planning your meals. These are just a few of the ways you can use to navigate the cruise ships of today. We'll complete the story in another article. Are you looking for a unique beach to enjoy during your vacation? 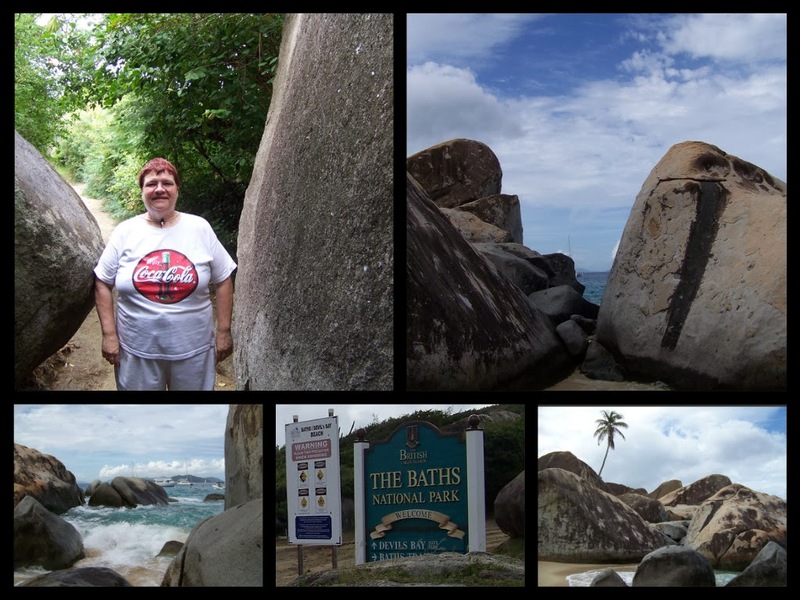 If so, The Baths, on the island of Virgin Gorda among the British Virgin Islands in the Caribbean my be just the spot for you. One of the most famous and popular beach areas in the Caribbean can be found here in the BVI. Large volcanic boulders populate the sandy beaches, forming natural tidal pools, tunnels, arches and scenic grottoes that are open to the sea. There's no other place quite like it on earth. You'll want to spend hours there swimming, snorkeling, and exploring these amazing rock formations. 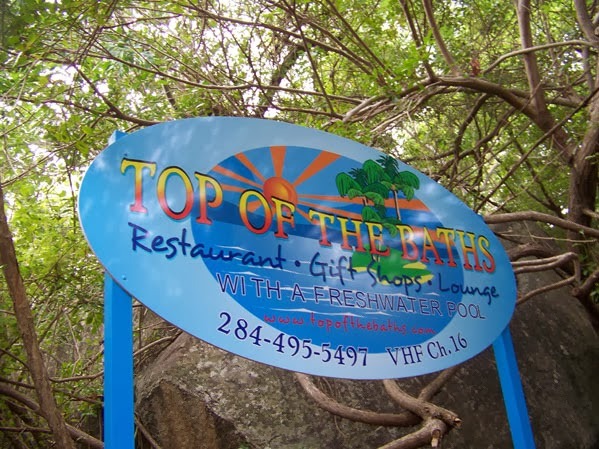 If you are spending the day there, you'll want to head to the hill overlooking the beach area where you'll find the Top of the Baths Restaurant. There is also a gift shop and lounge for you to explore while taking in the beauty of this area dotted with unique geometric shapes. You'll enjoy a panoramic view of the British Virgin Islands from this vantage point. Be sure to wear proper footwear for the hike to the beach. Once arriving at the beach you will find some lockers that can be rented. As you can see from the photo above, there are even some tight spaces that you can attempt to navigate along the way. Back in May, the Carnival Sunshine emerged from dry-dock after the $155m refurbishment of the Carnival Destiny which brought new features, such as the new dining options and waterpark to what is now known as Carnival Sunshine. The ship was sailing in Europe until this past weekend when it arrived in New Orleans which will be its new home through May 2014.
performance by YoungArts, which included jazz classics, tap-dancing and modern dance. On stage in the Liquid Lounge theater, Arison, along with Sunshine Captain Giuseppe Giusa, pulled a ribbon attached to an oversized replica of a Champagne bottle -- the crowd then watched on video monitors as the real thing smashed on the hull of the ship as is the nautical tradition. How do you breath new life into a 17 year old cruise ship? 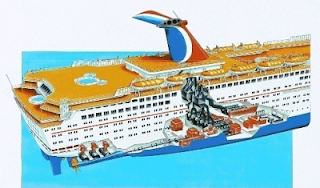 Watch these videos as Senior Cruise Directory John Heald takes you on a guided tour of the changes made to what was previously known as Carnival Destiny. You will be amazed at the transformation. It's just as good as having a brand new ship introduced to the fleet and it becomes more cost effective. 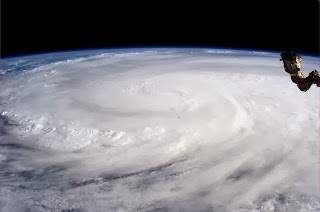 Tropical Storm Melissa formed in the Central Atlantic. The storm is brought strong gale-force winds to parts of the Azores. 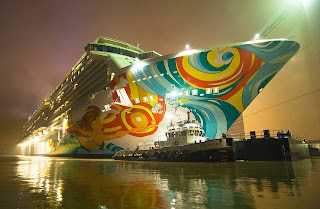 On 2 November 2013 the 146,600-gt cruise ship Norwegian GETAWAY, whose construction has taken merely 12 months, floated out of MEYER WERFT's covered building dock II. Weeks prior to that the shipyard was busy conducting extensive tests and machinery trials. Following the float-out more tests were carried out in the harbour and the ship was berthed alongside the yard's outfitting pier. 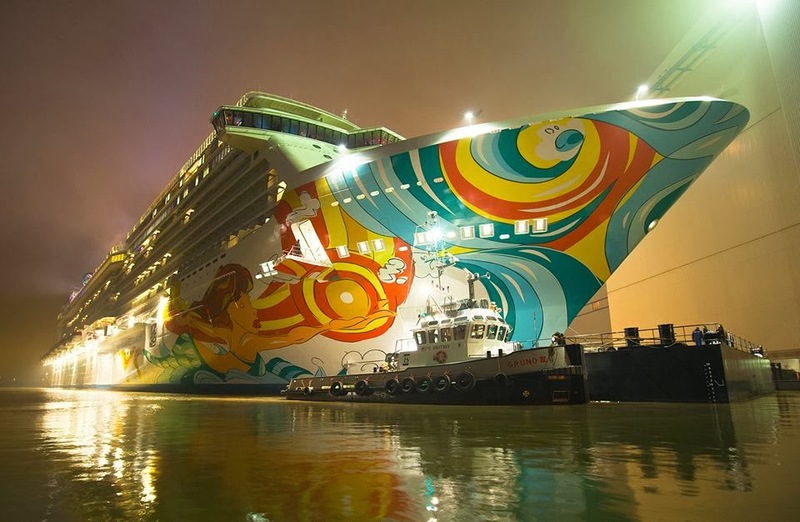 Norwegian Getaway will sail a 10-night Transatlantic in January 2014 from Southampton, England to New York. 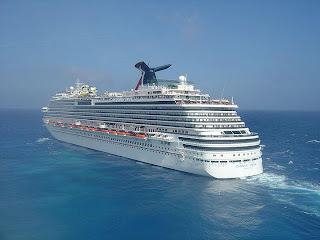 Starting in February, the ship will be home-ported in Miami and will be sailing 7-night Eastern Caribbean itineraries. 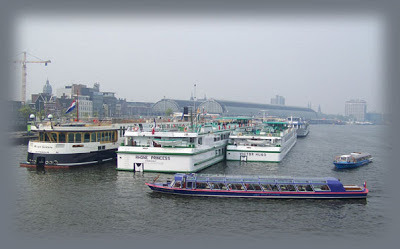 For more information about ship and schedules (click here). Super-typhoon Haiyan (Yolanda), equivalent to a Category 5 hurricane on the U.S. Saffir-Simpson scale, struck central Philippines early last Friday morning with sustained winds estimated at 195 mph (315 kph) by the Joint Typhoon Warning Center. Initial reports estimated that as many as 10,000 people were killed and thousands injured by the powerful storm. Philippines President Benigno Aquino III is now quoted as saying the initial estimate was "too much". Many governments and organizations are coming to the aide of the people of Philippines in the wake of the storm. Among them are several cruise lines who employee many Filipinos on their staffs, many of whom have been away from their families and friends for many months. This is a hard time for those separated from their loved ones. At the time of this writing, we are aware of the following cruise lines that have made statements and offered support. The lines have all pledged financial support and are setting up means for passengers to contribute onboard the ships as well. MIAMI – November 11, 2013 – Royal Caribbean Cruises Ltd. (RCL) will join humanitarian relief efforts in response to the catastrophic damage caused by Typhoon Haiyan in the Philippines, the company announced. Everyone at Norwegian Cruise Line is truly saddened to hear of the significant devastation in the Philippines caused by Typhoon Haiyan. Our thoughts and prayers are with the families and friends of our crew members from the Philippines who have been impacted. 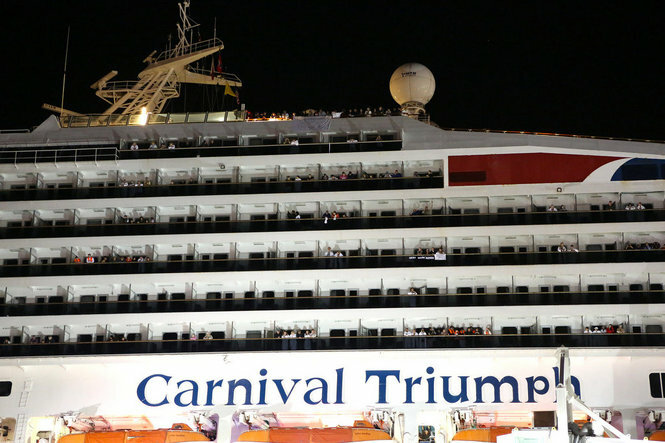 Carnival Corporation & plc, its 10 cruise brands and the Carnival Foundation will team up with the two-time defending NBA Champion Miami HEAT in making a pledge to donate at least $1 million to support relief efforts in communities affected by Typhoon Haiyan in the Philippines. Miami HEAT owner Micky Arison is also the chairman of Carnival Corporation & plc. "All of us at Carnival and the Miami HEAT extend our deepest sympathy to the Philippines and its people," Arison said. 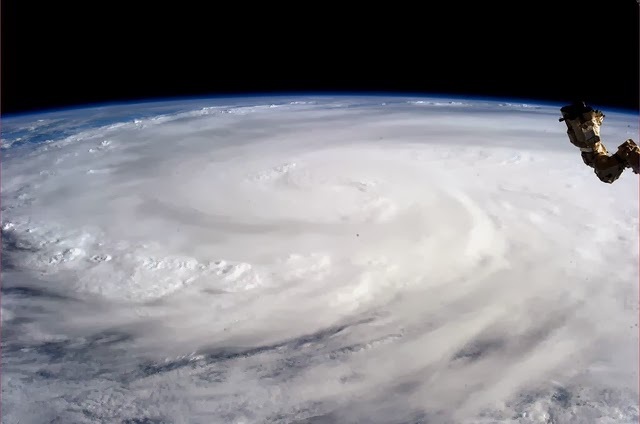 "The typhoon in the Philippines has caused massive destruction, and is having a tragic impact on people and families, including those members of our extended Carnival family who reside in the region. We are in the process of evaluating a variety of worthy organizations that are doing fantastic work in the Philippines. In addition to providing financial support for relief efforts, our collective thoughts and prayers are with all of those who have been impacted." Our thoughts and prayers are with all of those affected by Typhoon Haiyan in the Philippines. Many members of the Costa family are from the Philippines, and to support them during this difficult time we will be donating $100,000 to help our Filipino crew members, their families and friends. Our thoughts and prayers go out to the Filipino community currently in the country, on cruise ships, or elsewhere across the globe. 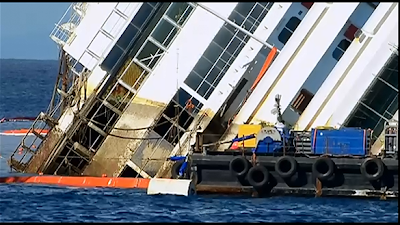 Shortly after the Concordia disaster, the government of Italy and various organizations rekindled their efforts to restrict cruise traffic in the Venice Lagoon. A law was passed that banned large cruise ships from passing close to Italian shores. It was to be a countrywide restriction, but due to the large tourism industry in Venice, the law was suspended temporarily. tons) from the Venice Lagoon starting in November, 2014. This doesn't mean that cruise ships won't be visiting Venice, but rather cruise ship traffic will be rerouted perhaps through the Contorta Sant'Angelo Canal, which is farther away from the best-known parts of the city. This scene, taken during our Mediterranean cruise which included Venice, will be a thing of the past. Until that time, we highly suggest you take advantage of cruises that include a stop in Venice and be sure to get up early as the ship sails into the lagoon. Even before the ban goes into effect late next year, there are other restrictions that will begin starting at the beginning of the year. The number of cruise ships 40,000 tons or more sailing in Venetian waters must be reduced to 20 percent of the current volume. That limit means no more than 5 cruise ships over 40,000 tons would be in port on any given day during the cruise season. Cruise lines will continue to include Venice in their itineraries, but they will have to make alternative plans, perhaps including tendering, in order to make that possible. What will be gone however is the sail by of attractions such as Doge's Palace and St. Mark's Square. When that is in effect, we suggest that you be sure to take a water taxi so that you are still able to see the city from the water. That is a perspective that is one you will cherish forever. We have been following this developing story for some time now. We've included links to some of our previous articles. Also, be sure to visit our post, Diary of Cruise with Chris to Greek Isles, for more information about Venice and ports that we visited. A new tropical depression formed on Friday southwest of Mexico and strengthened into Tropical Storm Sonia early Sunday morning. THE WATCH AREA TONIGHT AND EARLY MONDAY. 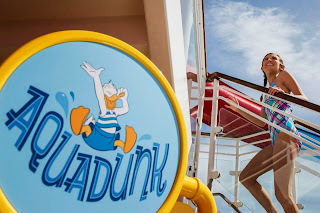 AquaDunk on the Disney Magic is a thrilling new three-story body slide that begins with a surprise launch when the floor beneath guests’ feet opens like a trap door. 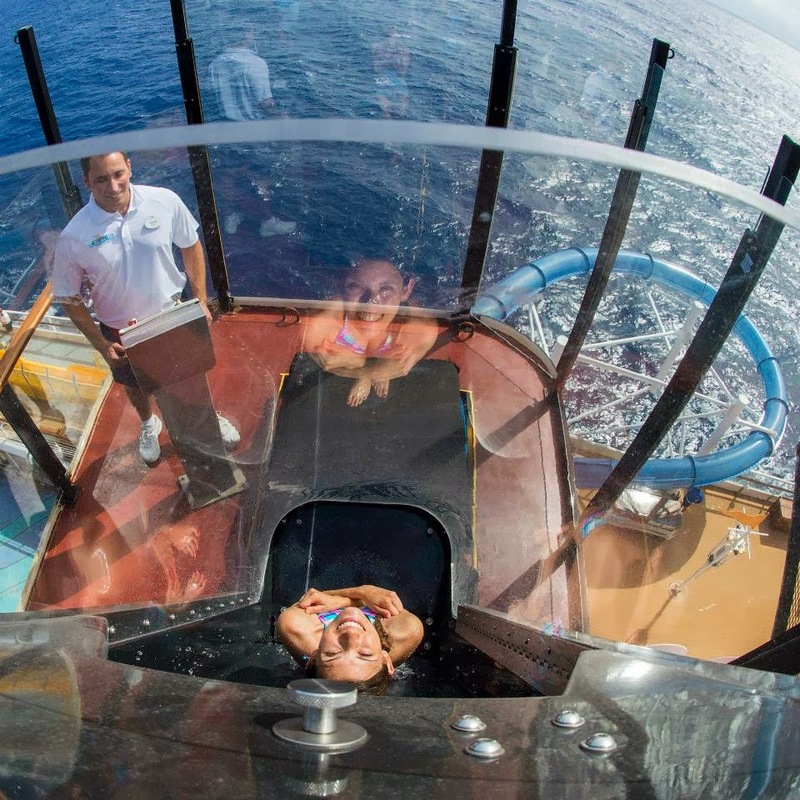 The drop sends them on an exhilarating, swift and splashy ride in a translucent tube that extends 20 feet over the side of the ship. The Disney Magic has just emerged from dry dock and is sailing, for the first time ever, from Miami, Florida to tropical locales like Grand Cayman, the Bahamas and beyond! Guests must be at least 48" or taller to ride AquaDunk. Please note that the slide's entry capsule may prohibit Guests of certain body sizes or those weighing more than 300 lbs. from riding. 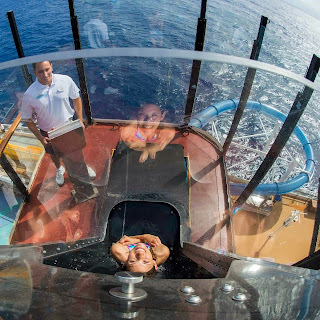 Operating hours are likely to vary, so once you're onboard, check the Personal Navigator—the Disney Cruise Line daily newsletter detailing all there is to see and do—for the most accurate operating times. The AquaDunk is just one of the many changes onboard the re-imagined Disney Magic, which has emerged following the completion of its dry-dock in Spain this month. To learn more about the changes and see an album with the Disney Imagineers renderings as well as some additional images, become a fan on our Facebook Page and click the Disney Link on our Welcome Page. Click on this image to go there now. 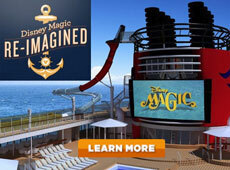 The newly re-imagined Disney Magic is now sailing from Miami. Enjoy 3-, 4- and 5-night Disney Cruise Line sailings to the Bahamas, or 5-night Western Caribbean cruises, all departing from this vibrant South Florida city. Explore the Everglades by airboat, stop by Little Havana, soak up the sun on South Beach and more! Most cruise lines now offer an "Easy Walk-off" option for those that don't have a lot of luggage, or for those that have early flight arrangements. It is important to note that if you plan to use this method, you must be able to handle your entire luggage on your own. The crew will not be allowed to assist you. For those that want to avail themselves of the normal process, bags must be packed and placed outside your cabin by the stated deadline. This is usually shortly after late dining is completed. 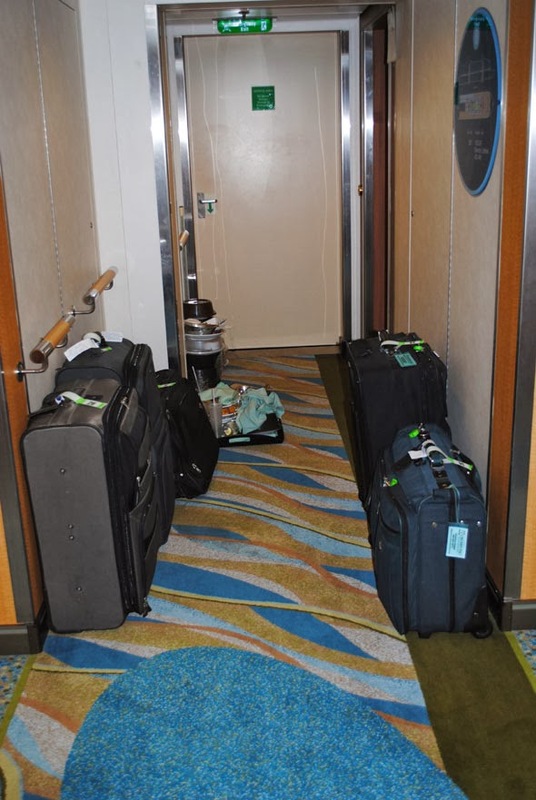 If you attended the cruise director's talk, he may have told you stories of passengers forgetting that they would need clothes in the morning and having to walk off the ship in a towel. This may sound silly, but you do need to think about what items (clothing, toiletries, medicines, etc.) that you'll need in the morning. We always have at least one carry-on bag with us so that we'll have a place to put our sleepwear, shavers, 3-1-1 bags with all our toiletries, and souvenirs that we don't want to pack in our larger suitcase. Of course, you'll need your passports and other important travel documents with you as well. Pack your large suitcase(s) and also have your carry-on packed, or at least know what will go in them, before placing the bags to be picked up outside your cabin. 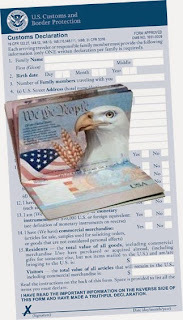 Before retiring to bed, we suggest that you fill our your U.S. Customs Declaration Form and place it together with your passports. Only one form is needed per family that are traveling and living together back home. 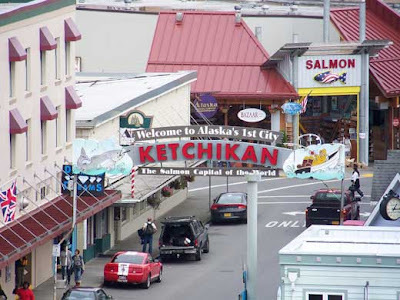 You'll need to know how much you spent in port and on the ship for things like souvenirs, jewelry, liquor, and clothing. 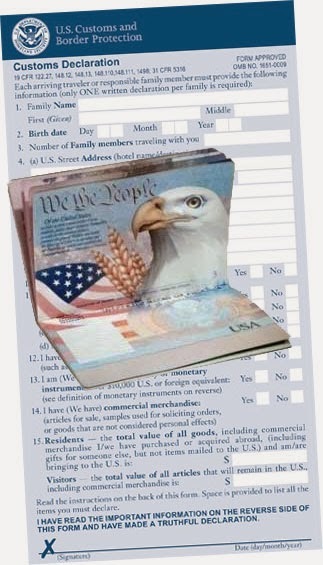 Anything that you purchased and are bringing off the ship must be counted. You will have an allowance per family and the good news is that for things like liquor, your children count in determining the allowance. Since the morning is an early one (usually all guests must be out of their cabins before 8 AM) you'll want to complete this the night before. Doing so will allow you time for breakfast and a smooth, hassle free departure. Disembarkation is controlled by the U.S. Customs & Border Protection. You'll find that there are several areas of the ship that will be blocked off and traffic patterns are strictly enforced. You don't want to attempt to enter a controlled area. It is for this reason that waiting areas are suggested by the crew in the instructions. Don't proceed to the disembarkation point until your luggage color is called. This will help keep the process moving for all passengers. Go have breakfast and try to keep your entire traveling party together. This way when an announcement is made for your luggage tag group, you will be able to disembark the ship. 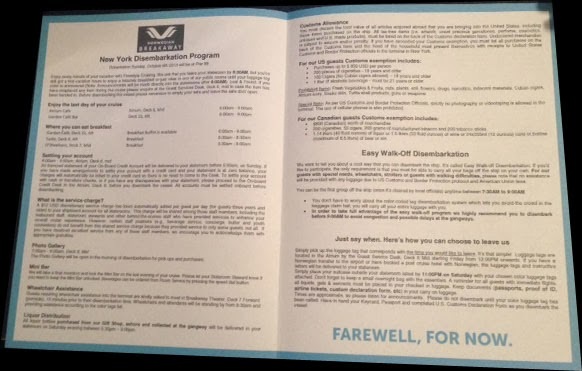 There is a definite order of disembarkation and that will be listed in the instructions. You might want to keep a copy of that handy so that you can tell when it is close to your time to disembark. That allows you time for that one last bathroom break for example. Note that the times listed for debark time are only approximate. It is possible that the process may be halted several times to allow for crowd control. There are a maximum number of passengers that can be in the terminal at a given time and as we mentioned, this is strictly under the control of the CBP. Therefore, if there any doubt that you'll need more time, take the earlier tag when picking your luggage tags. 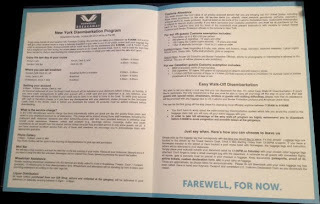 Cruise lines sell "transfers" which can be prepaid or purchased on board the ship up to the stated time. This is the easiest method for transferring to the ship because the ship's personnel will direct you to waiting buses for the trip to the airport. You'll be amongst the earlier groups to depart the ship as well (ordered by flight times). Caution: this could be a higher cost that arranging your own transportation, but it typically be the easiest. Your travel professional can go over the various options applicable for your pier and airport location and can assist in booking the arrangements with the cruise line or other provider. Remember, to be sure to allow sufficient time for the debarkation process. 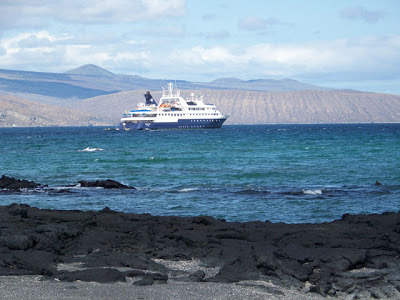 In many ports it is possible to book a post-cruise tour through the cruise line. This is very similar to booking transfers but in addition to the transportation to the airport, you will also see one or more local sites. This is a great option for those that booked later flights. Consult the shore excursion sight before your cruise or during to determine your options here. The final full day of the cruise has arrived and fortunately it is a sea day. That means you don't need to rush breakfast and get ready to go into port. You plan to take full advantage of the ship and let any remaining stress melt away. Last night you didn't have time to read the daily paper, so you pick it up and start to see what activities are planned by the staff. 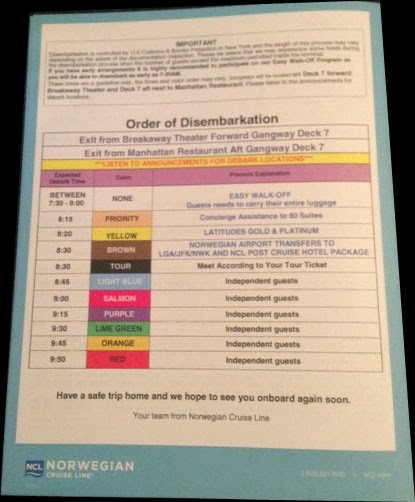 Scanning through the list of morning activities, you see one that catches your eye ... "Debarkation Information - hosted by Cruise Director". There is a note that says, one person from each family should attend. Wait, what - I'm on vacation - what do you mean? 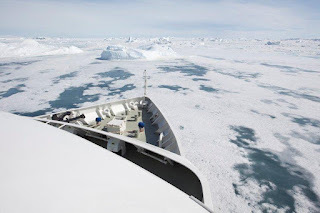 Especially if you are a cruise rookie (first time cruiser) it is highly advisable that you attend any briefing offered by the Cruise Director or staff. 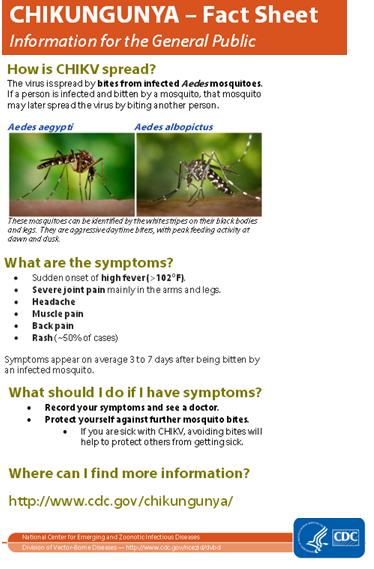 This will make your life much easier, since they will provide all the information you need and answer any questions. On most ships, this information is disseminated in multiple ways, so if you have some conflict, you can skip the session. For example, there should also be more information either in the daily paper or as a supplement covering everything you need to disembark the ship. 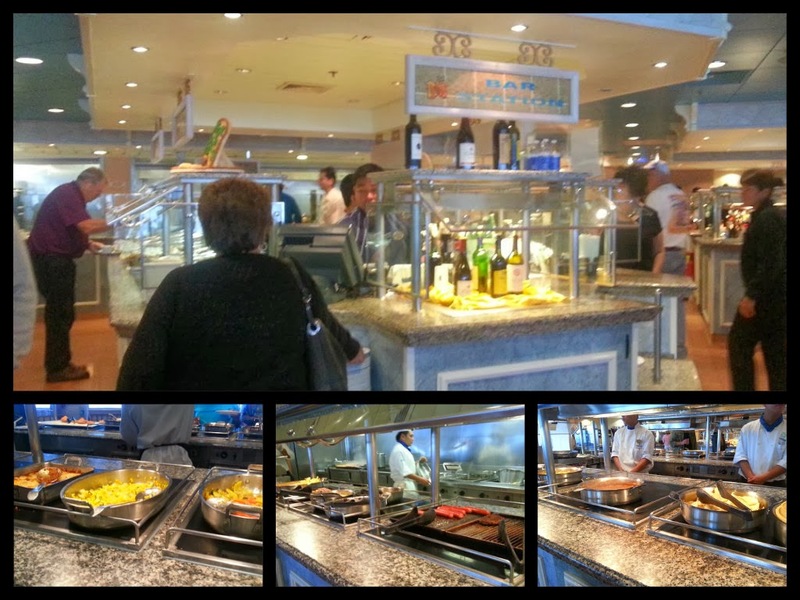 Often the debarkation talk is recorded and available for viewing on the ship's TV station during the rest of the day. 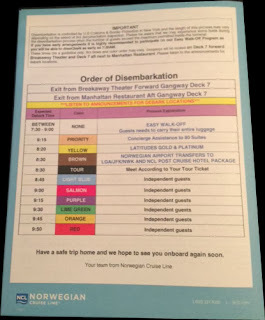 When you listen to or read the information about debarkation, you'll soon discover that by mid-morning everyone is expected to be off the ship so that the crew can welcome aboard the new set of passengers. There is a lot of activity that happens to make this possible. You may not realize it, but your departure time was determined by you when you booked your trip and made travel arrangements. How's that you ask? When you picked your return flights, or made other arrangements for your return home, you determined the time that you needed to be off the ship in order to make your flight on time. Upon leaving the ship you'll need to collect your bags, process through Customs, and board a taxi, shuttle bus, or other means of transportation to your departure destination (airport, bus, train station, rental car etc.). There are a lot of variances in terms of when the cruise line calls your luggage group and when you are outside with bags in hands. It may take some time to catch an elevator and actually get to the disembarkation point on the ship. Once through there, it's usually a walk along a ramp, down the escalator or elevator to the lower level, where you'll find your baggage sorted by color tag. There are porters to assist you in finding your bags and getting you through Customs. In most cases, the pier isn't far from the airport, so you may have about 30 minutes to an hour for transfer time from pier to airport. There are several ways to get to the airport, but for now, let's just assume you need to factor in some travel time. Since you will be checking bags, and there will be several hundred or more of you arriving at the airport at the same time, you'll need at least 1.5 to 2 hours for checking in and clearing airport security. The rule of thumb is that for flights before noon, you'll want to be in one of the first groups off the ship but for later flights you can take your time. In Part 2, we'll talk more about preparation the night before debarkation as well as what to expect in the morning. 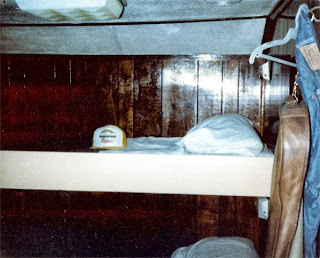 We arrived at the pier for our stow away night aboard the Yankee Trader and were shown to our cabin. As you can see from this picture, our beds were actually twin bunk beds. Not shown is the washroom which consisted of a shower, toilet, and sink "all-in-one". The one thing that stands out from our memories is that we had a problem one day, when the shower would not turn off, and had to summon someone to resolve the situation. Notice the beautiful wood above, which is something that we vividly remember about our cabin and public areas of the ship. Here is another example (left) of the beautiful wood on the ship. This may be the only time in our 30+ years cruising where we had a cat as a member of the crew. 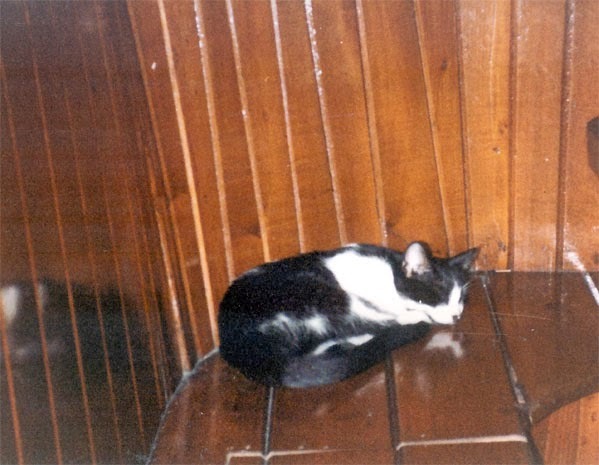 The cat was quite content sleeping on one of the benches on the main deck. 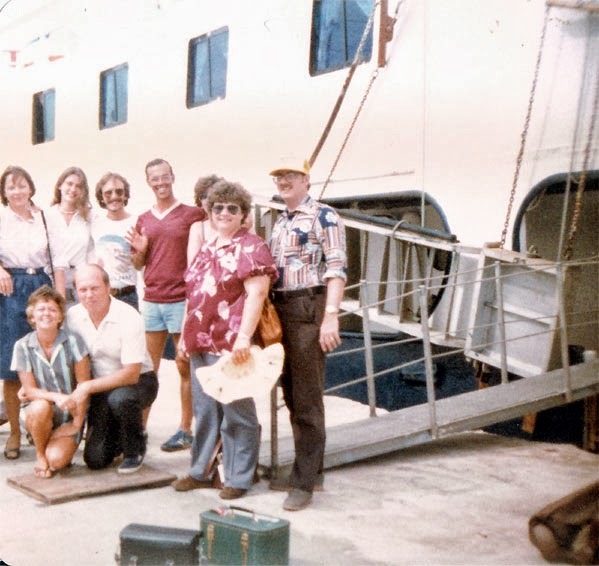 The Barefoot Windjammer cruises were structured for two different types of passengers - those that wanted to actively participate in the sailing adventure and those that were content to be more passive. 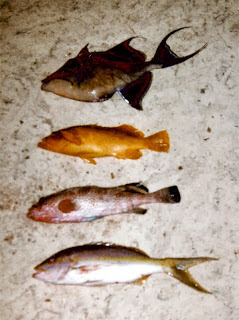 One night, the dinner menu was quite simple - it was the catch of the day. That meant that the crew, and any passengers that were interested, could fish for our dinner. Here are some of the fish that were caught. 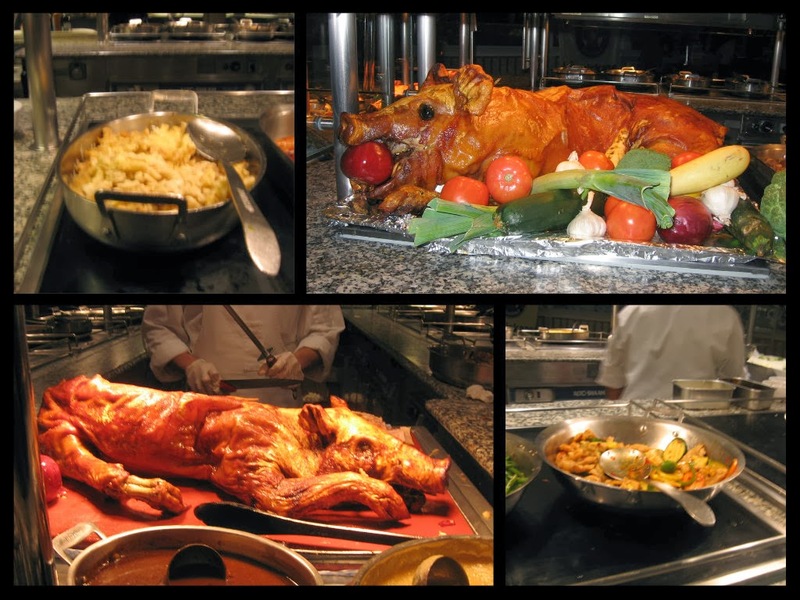 As mentioned in our previous column about our first cruise, the Captain's dinner consisted of a pig roast with all the trimmings. 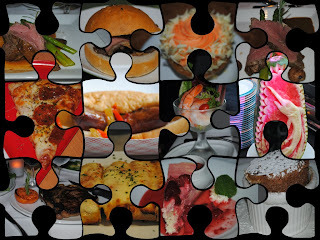 Certainly, food was an integral part of the experience even on our first cruise. One of the benefits and downfalls of cruising on a small ship is that you meet your fellow cruisers and build relationships during the cruise. It is therefore hard to say good-bye at the end of the voyage. As the sun sets on the Fantome, which was sailing the same itinerary with us, we conclude our story about our first cruise. The memories from this trip have not faded over the years. Our love for cruising and the sea began that week. We love sharing our experiences and knowledge with others. If you have not taken a cruise before, consider that sometime in your future. Perhaps you too can have lasting memories like these. Thank you to the crew of Yankee Trader - if any of you read this story, we'd love to hear from you. Our first cruise was a 3-day trip to the Bahamas on a small sailing vessel which could travel under mast or by motor. See our previous article, Our Very First Cruise, for the beginning of the story. 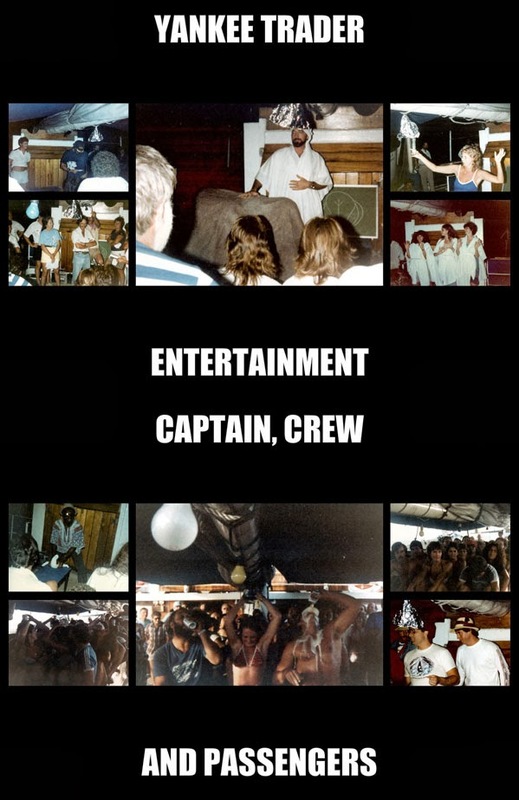 Unlike the modern cruise lines that have all sorts of entertainment from small lounge shows to Broadway-style musicals, nightly entertainment would be provided by the Captain, crew, and passengers. The "stage" was the upper deck which also served as the main dining room, bar, and meeting area. In the center image at the top left is our captain with his magical elephant. You can't see it in the picture, but there is one of the passengers laying on the ground and about to get a surprise shower from the elephant. Props for the entertainment was whatever you could find onboard the ship including towels and other supplies. We had some creative crew and passengers. Another event was the rowing contest where all the passengers grouped on the wooden platform beneath the main mast (their row boat). I'm not certain they made much progress "sailing" but the beer that was flowing certainly kept the spirits high as they fought the high waves. 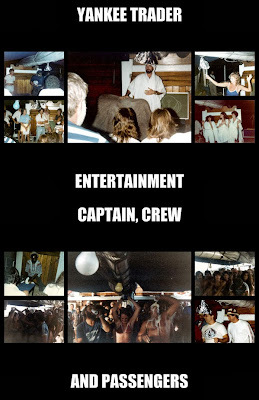 Captain Jon S. Helmick was the skipper on our first cruise. We owe a great debt of gratitude to him and the rest of the crew for making our first cruise so special. 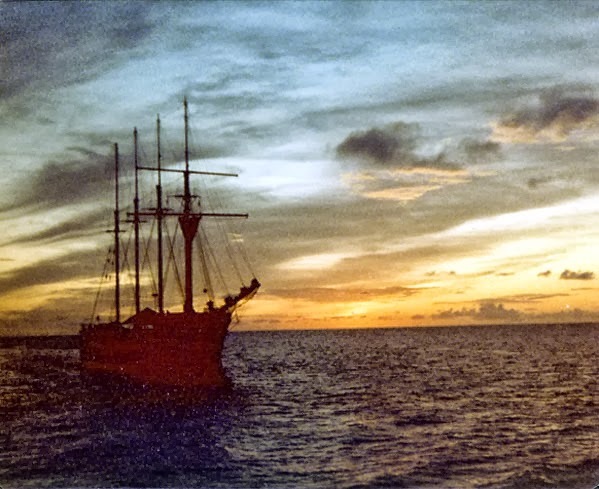 It is now more than 30 years since that first voyage and we can remember the events as if they happened yesterday. That certainly says something about the dedication of that crew to providing a great experience for their guests. We hope that your first cruise is as memorable as ours. And for those that have been sailing for years, we hope that you have many fond memories like the ones we've shared here.